The Maltese Islands are blessed with some of the most diverse diving in the world. Gozo is no exception, with awe inspiring drop offs, wrecks, caverns, and breath taking landscape it is the perfect place to combine your diving with a Specialty course or two. 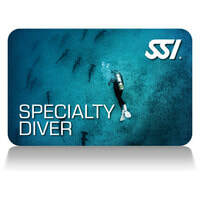 By completing any two SSI Specialty programs that interest you, and having 12 logged dives, you will automatically receive the SSI Specialty Diver recognition rating. The advantage of booking the SSI Specialty Diver Bundle with us is that your instructor will be able to create a tailor made course to suit your goals and there is also a cost savings against booking the Specialties separately. Price is based on the total of your two chosen specialties minus 10%.